ANNAPOLIS, Md. — A small brass key opens nine glass cabinet doors on the third floor of Ricketts Hall, unlocking one of football’s best-kept secrets. 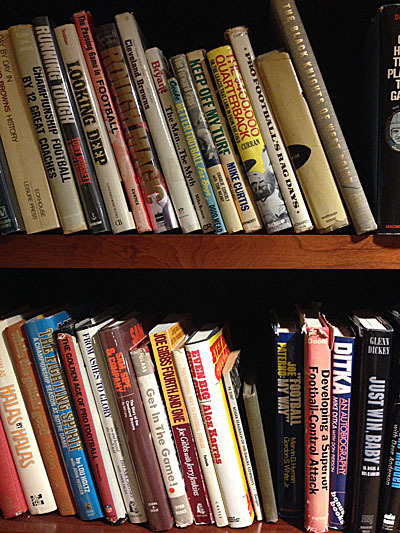 Four hundred and thirteen books (by a hand count) about America’s pastime, many written before football was America’s pastime. The oldest dates back 124 years: American Football, Walter Camp, 1891. 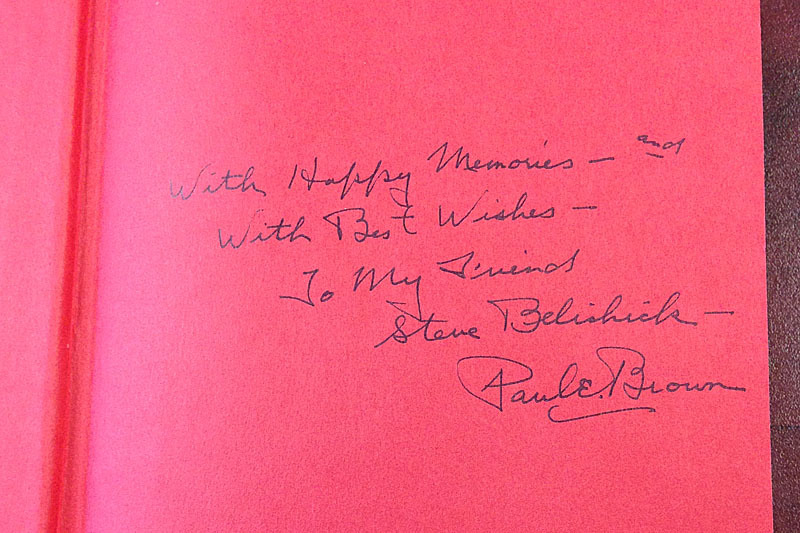 Other authors include Rockne, Lombardi, Staubach and Paul Brown. There’s a comb-bound packet on the T-formation used at North Texas University from 1946 to ’50, and Sol Metzger’s illustrations of Football’s Winning Plays in 1927 (shift plays, in which the offense outflanks the defense and runs the play before the opponent is set, were “much in vogue”). 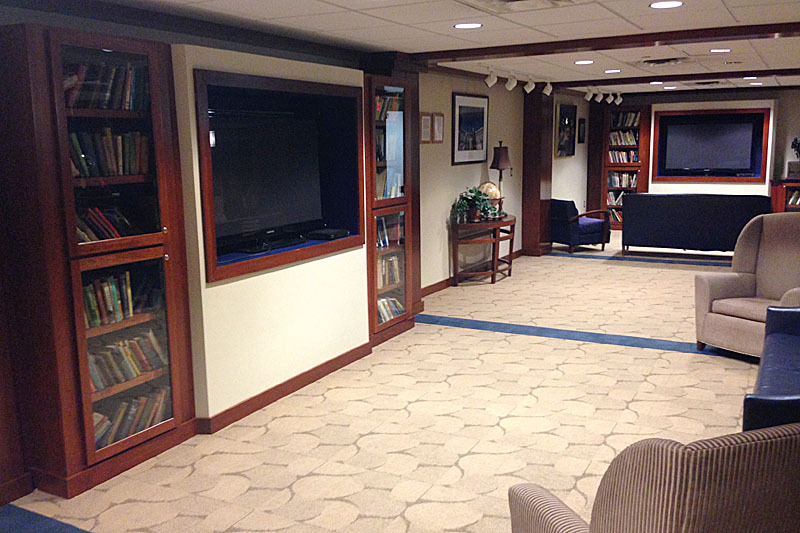 That the library is here, lining the walls of a cozy Midshipmen lounge in the U.S. Naval Academy’s football building, is no accident. 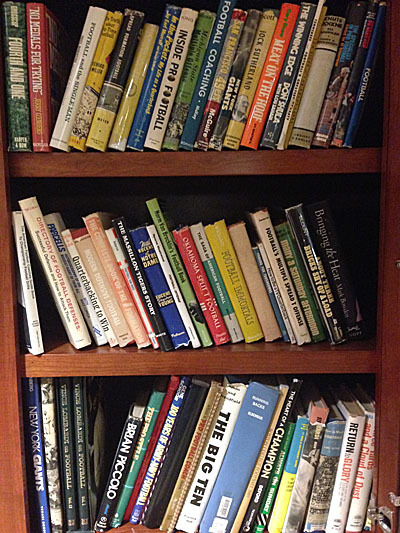 A longtime Navy assistant coach and scout began collecting these books in the 1950s. 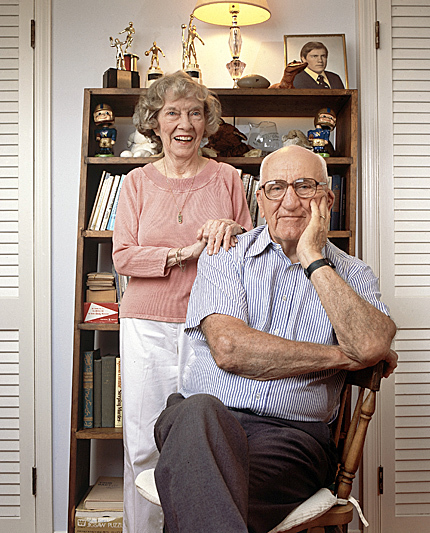 He made time on advance scouting trips to scour local bookstores, though many are gifts from the authors, his friends in the coaching industry. 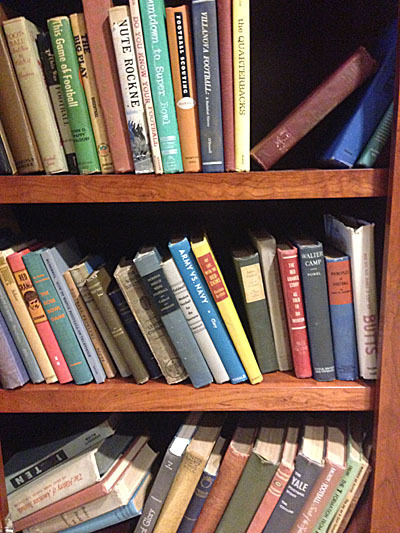 There may not be a collection like this anywhere else in the world. 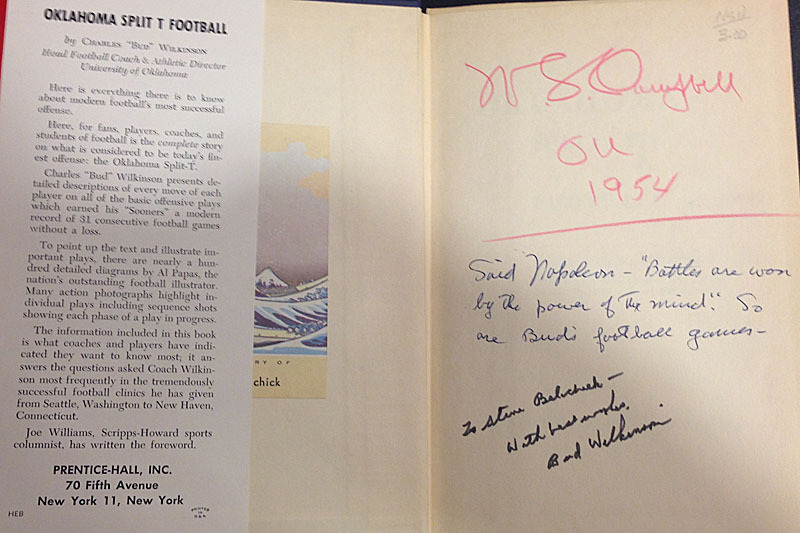 On a recent afternoon in January, one of Navy’s assistant football coaches makes this point to a visitor by randomly pulling a well-worn red-jacketed book off one shelf: Oklahoma Split T Football, Bud Wilkinson, 1952. He guesses that there are notes inside. He’s right. 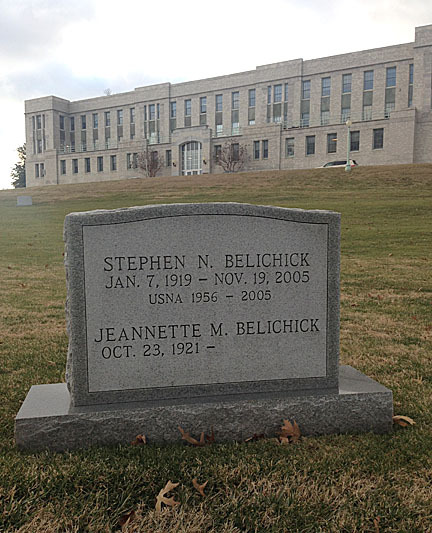 The Naval Academy is where Steve Belichick raised his son. 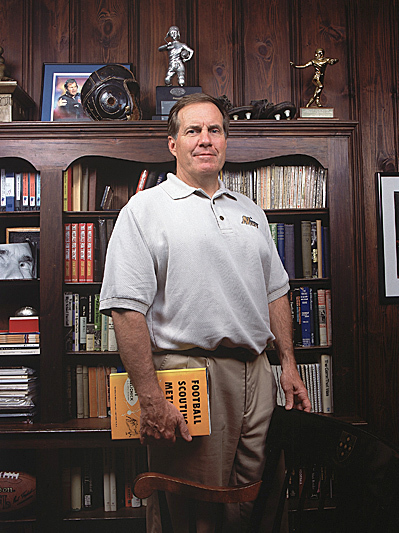 And this is the material on which Bill Belichick was raised. 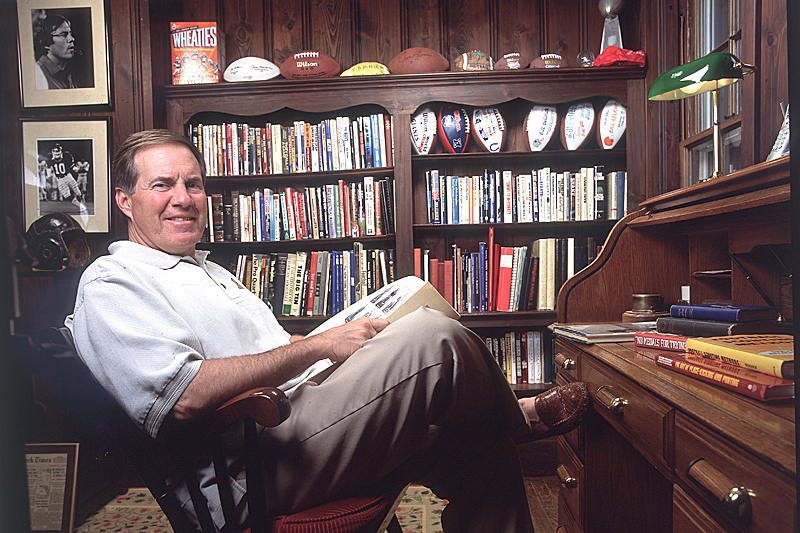 There are many ways to evaluate Belichick as a head coach—his 211 regular-season wins (fifth all-time), or his three championships, or the Spygate and Deflategate controversies that threaten his legacy. No matter what, he’s one of the most intriguing figures in NFL history, and here in this room is the foundation of the way he coaches the game. 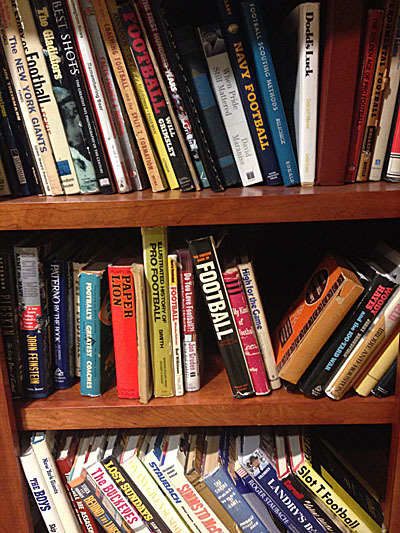 The books are in large part display pieces now, but as The MMQB flipped through the dusty and yellowed pages, we pulled more than a dozen excerpts that, despite being written decades, if not a century, ago, still seem relevant to Belichick's modern-day strategy. 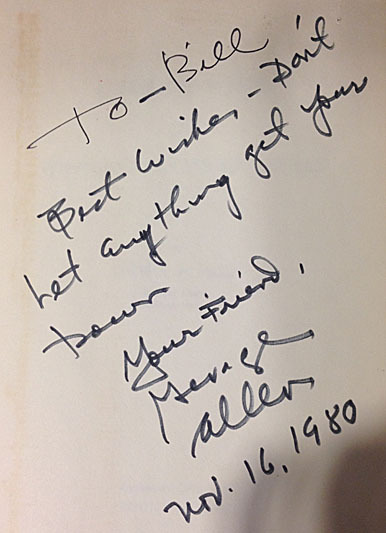 Like the Napoleon-inspired inscription in Wilkinson’s book, coaching is about using the power of the mind. Here, in Ricketts Hall, is a window into one coach’s mind. There is always a doubt in the minds of coaches as to which is the more important, offense or defense. Both are important, but I do believe it wise for a team to pay more attention to offense. In case you have an early game with a rugged opponent your defense may stop them dead. However, along in the second half with the score nothing to nothing there may be a fumble and one of the opponents may run a long distance for a touchdown and kick goal. The score would then stand seven to nothing against you and the thing you would have to call upon under these conditions would be the offense. If you have only defense you would now be helpless. For that reason I always pay a little more attention to offense than defense, as it is more difficult to get results. Offense involves more finesse in timing, judgment and more complex team play. How to be a Successful Coach (1961), James B. Bonder, line coach, West Chester State Teachers College, Pa.
What will be said in this chapter will be more disturbing than appealing to some; nevertheless, truth must reign. … Knute Rockne, and, more recently, Jim Tatum compared athletics with ultimate success in war. It is no accident that they proceeded along that line of reasoning, for successful athletics require as strict obedience as does the military. Imagine Yogi Berra saying to Mickey Mantle, “Mickey, I followed you the last time in the batting order. Now let’s be democratic and fair—this time you follow me.” Picture Casey Stengel inquiring of the grandstand managers whether to bunt or hit away. Years ago, Mr. Veeck, of the St. Louis Browns, by hurriedly taking a consensus of opinions as to the strategy to be employed, permitted the crowd to manage the team. Needless to say, Veeck’s club simply lost another game. Leadership by all leads to leadership for none, and that spells chaos and confusion. … Successful coaches permit no exception to the instructions coming directly from them. Paul Brown, of the Cleveland Browns, personally calls every play by a system similar in principle to carrier pigeons, with the guards carrying messages. In athletics, as in war, there cannot be compromise. To be democratic would mean having people lead who have had no training in leadership. You must be secure in your sense of unchallenged authority in order to be a real instrument in your team’s success. In making all team and combination plays in foot-ball there are several distinct points to be borne in mind, and from the very beginning of his foot-ball days the player and captain who wishes to succeed must study his play in relation to these points. To take these up in order, the first is to make use of a play, if possible, for which the opponents are the least prepared. This may be accomplished in two distinct ways. It may be done by masking or disguising the play, or it may be done by making the move and getting the ball in motion quickly before the opponents are ready for any play at all. The first method is by far the easiest, because it depends only upon a few easily learned tricks of formation. The latter is the more difficult, because it takes the greater part of a season’s entire practice and coaching to make a team competent to play a fast game. But it is well worth while to combine the two, for they go admirably together, and a fast team is almost always a clever one, and usually a very reliable one. The men playing in Super Bowl XLIX are remembered by their high school and college coaches, who share stories about their former charges playing a church organ, tricking out a beat-up Cadillac, giving haircuts in the locker room and getting trapped in a locker. While it’s the offense that gets the glory and the glamour, it is the defense that brings the championships to the team. Of the nine championships won by the Packers—division championships, league championships and Super Bowl titles—in only one game did we allow our opponents more than 20 points. In the rest of the games we held our opponents to 14 points or less. And in that NFL championship game, where we did give up 27 points against Dallas in 1966, it was the defense, with a minute and a half to go in the game, that stopped the Cowboys on our goal line and preserved the victory for us. 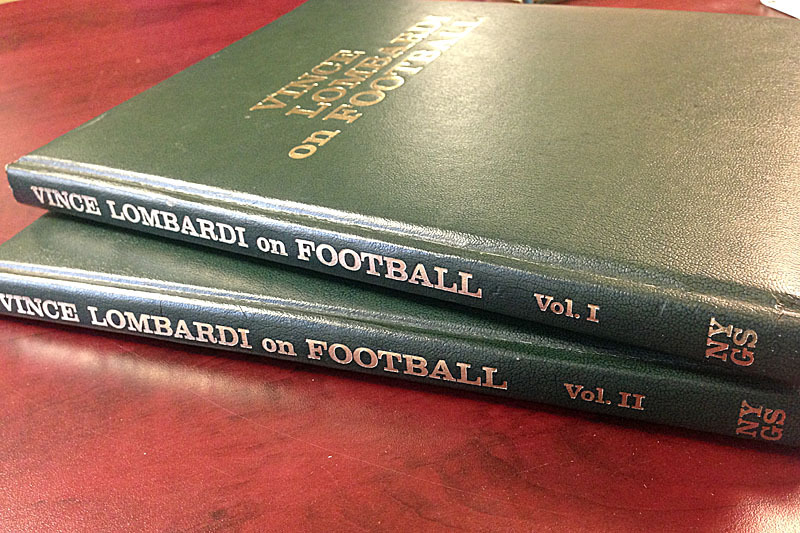 When I came to Green Bay in 1959, before we went to training camp we ran and reran the films of all the Packers’ games of the previous two years. We graded every player and then we sat down to see what our primary needs were. Our conclusions were unanimous—we needed defensive help. There is nothing more demoralizing to a team than to watch the opposition run up and down the field on you, and, no matter how good your offense, if your defense can’t stop anybody, believe me, you’re not going to win any championships. Defensive football is a game of abandon, and you have to have the kind of players who will be able to play with abandon, the hell-for-leather types. Football is not satisfied with the average man. The average man is just that. 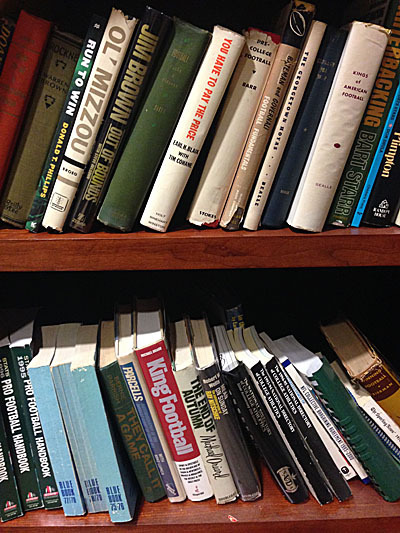 Football seeks the championship or thoroughbred man. When you call on a thoroughbred he gives you all the heart and sinew he has. When you call on a jackass he kicks. Spread formations are not new to football. To my personal knowledge, some form of “scatter” stuff was employed by coaches as early as the first decade of this century. While probably not as ancient as the T, which evolved early from the first mass scrimmages, the idea of moving one or more men out to flanking positions from the main body of the formation came along in the game’s infancy. During my thirty-five years of playing and coaching, I’ve seen many types of offense wax and wane in popularity. They are something like women’s styles in clothes. They seem to blossom, bloom, fade—and come back twenty years later as something entirely new. I have had opposing coaches tell me it is impossible to construct a defense that will care for every possibility. That is true, of course, for every type of formation. But with our type of spread, we are honestly convinced that it is easy to pick out and attack the flaws in a defense more rapidly and effectively. 'You have to stop Gronkowski.' It's easier said than done thanks to the Patriots' use of formations and route combos. Here's how Gronk keeps getting open. The success of the Browns soon had people talking about a “Paul Brown system,” but I never laid claim to any such thing. I suppose they referred to our general philosophy encompassing such things as our practice procedures, sending in the plays with messenger guards and our belief in a wide-open offense, particularly in our passing game. Whatever the reference, many of the principles are in use today. I’ve always felt that underlying any football system there must be a philosophy, a series of basic beliefs that set the tone for the players who make all of the game’s technical aspects come alive. As for my own, it is really nothing more than those things I believe in myself, the bottom line of everything that is necessary to be successful in life, as well as in football. We made a point of not locking ourselves into running first and establishing a pass offense later, or vice versa. Our theory was: Move the ball, any old style. pg. 15: The unbalanced line is becoming more popular in present-day football and a study should be made of this phase of the game. The experienced scout will see many things in an offense using the unbalanced line that are different from those in an offense run by a team employing a balanced line. For example, there is a difference in blocking on many plays, since the unbalanced-line offense will utilize a tackle that pulls and leads the play, a maneuver not used with any regularity from a balanced line. pg. 43: If a team uses an unbalanced line, a simple way to record it is by the use of numbers—indicating the players left of center with the first digit, and those to the right of center with the second digit. For example, the numbers 4-2 would indicate an unbalanced line left, while the numbers 2-4 would mean unbalanced line right. In scouting a team such as the University of Maryland under Tom Nugent, the same system can be used to indicate not only an unbalanced line right or left, but other unusual offensive alignments. Maryland is very apt to, and often has, come out and line up with five men on one side of center and one man to the other side. This has been mixed with a balanced line, a 4-2 and a 2-4 line set. These line variations give a complex picture of formations. Gambling is a subject which fascinates fans. They like it. So do I. But I hope they wouldn’t go against a game rigged 60-40 for the house. I don’t like to gamble, either, if I can’t see something close to an even break on the odds. Nevertheless, a small percentage of my correspondents through the years demand suicide gambles from me. They urge me to try to hold the ball on fourth down anywhere on the field, no matter what the circumstances. They also want to see lots of long passes thrown, without regard to the caliber of defense we face from game to game. Well, that’s not gambling to me. That’s hara-kiri. I think these few fans are like the people who love to see a free winger in the boxing ring, a fellow who rushes in with little wariness and small respect for his opponent, and who is generally carried out cold. He may put on a good show for a short while, but he is not going to win much more than beans money for his efforts. It’s the same in football. The team which wades in taking reckless chances is bound to be tagged on the chin. It’s a scientific game, and not a slugging match. The key to winning the Super Bowl for the Patriots will depend on their ability to keep Seattle's QB under wraps. Here's how New England's defense could do it. Few coaches clearly realize the paramount importance of a carefully planned and organized drill schedule. The secret of good performance at critical moments is found in drill. No soldier ever benefited more by intensive and carefully planned drill than does the football player. It is through drill and only drill that the coach can be reasonably sure of good performance under game pressure. Often simple alterations can be made in offensive plans to destroy some of the patterns that have been established. 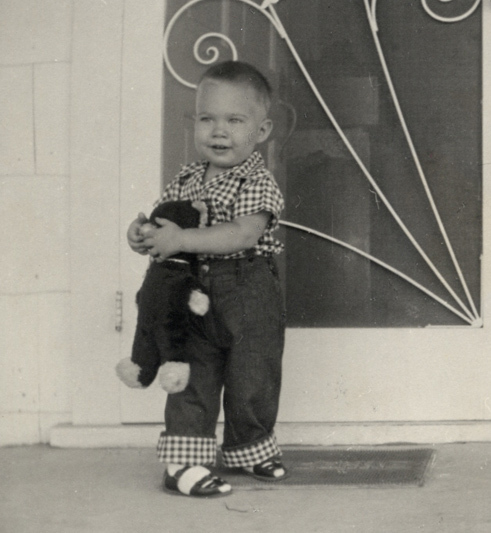 This was brought home forcefully during the 1960 season at the Naval Academy. In checking over the play distribution from the various formations prior to the game with Southern Methodist University, it was found that we were developing some strong play tendencies from several formations. The plays could have been run from other formations but they had not been, simply because the quarterbacks got into a set pattern. This was pointed out to the quarterbacks and the ready lists (plays to be run from each formation) were changed to alter the pattern. The results showed that our most successful plays in that game were the ones run from formations from which they had never been run in prior games. Show me a team with a great forward passing attack, but not much in the way of a good running attack, and you will find a .500 ball club, one that loses about as many games as it wins. You young quarterbacks with the strong arms and the ability to throw the long, accurate pass, don’t you ever forget that the forward pass alone has never yet won a championship, and what is more, it never will! Pg. 200: A coach can never spend too much time on defensive football. As I look back on my days as a student at Notre Dame I realize more than ever that perhaps the greatest secret to Coach Knute Rockne’s success was his defensive genius. It is true that his many offensive innovations captured the headlines, but whenever his teams played a truly great opponent the score was invariably low and the game was won by Notre Dame because the enemy was unable to cross the goal line. Opposing coaches were so busy trying to fathom his offensive maneuvers that they were unable to crack his defensive code. In many offenses the individual blocker is told exactly where and how he must line up. In many instances the offensive man may be pitted against a physically superior football player who can beat him regardless of how hard the former may try. When this happens the offensive man is in for a very unpleasant experience. He may keep trying, but chances are that after awhile he will give up on the uneven struggle. This individual admission of defeat on the part of one player usually spreads to the rest of the team. In our offense only the center takes the same alignment each time. All other linemen have almost complete freedom in the alignment they assume. We believe at Oklahoma that the individual offensive player never need feel that he can be dominated in the game by a physically-superior opponent. I do believe it is well to have three or four trick plays in the repertoire, besides the ones just mentioned, as they give the team a lot of confidence. They have something in reserve to call upon in case things get bad in the second half. It is much like a man carrying a revolver feeling much safer about meeting a hold-up man. However, he may be held up so quickly sometime that he will not have a chance to use his gun. And the same thing holds good for the team with the trick plays. A golfer is as good as the club he chooses for each shot. A football team is no better offensively than the judgment of its quarterback.